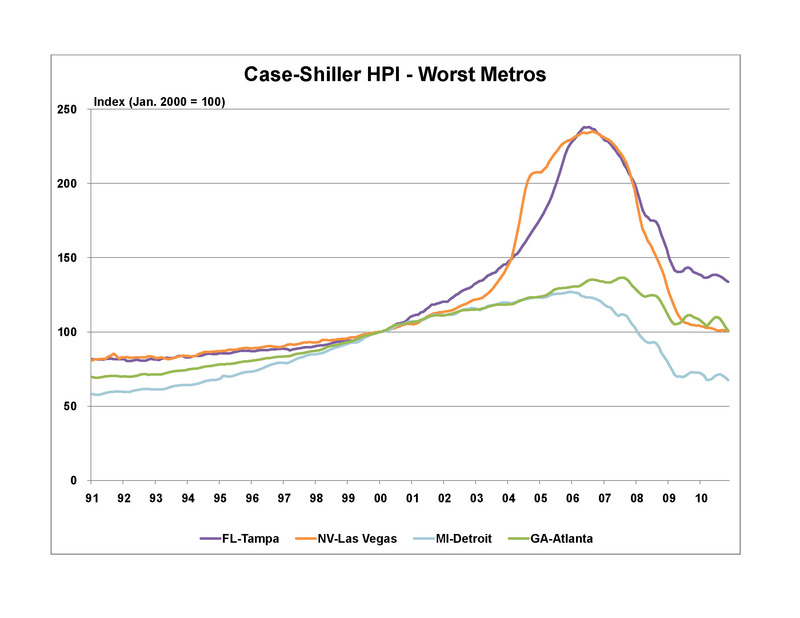 The release of the Standard and Poor’s Case-Shiller Home Price Index (HPI) for December and fourth quarter of 2010 indicates that house prices continued to drift down, despite the improving economic environment. The National House Price Index declined by 3.9% (NSA) in the fourth quarter and is down 4.1% from the fourth quarter 2009. The Composite 10 (CS10) and the Composite 20 (CS20) posted month over month declines of 0.9% and 1.0% (NSA), respectively in December. On a year-over-year basis the CS10 and CS20 are down 1.2% and 2.4% (NSA), respectively. The National Home Price Index declined for the second consecutive quarter, but it remains 1% above its first quarter 2009 low. 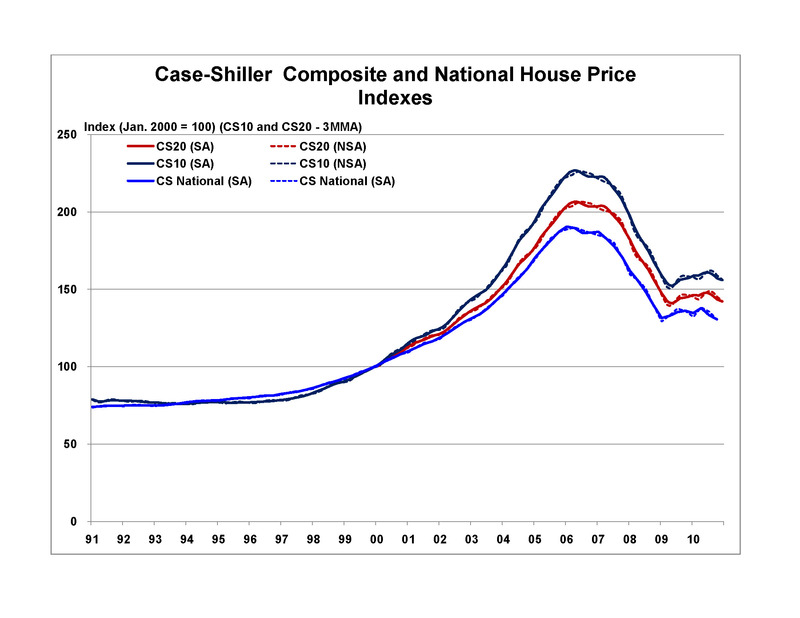 Similarly, the Case-Shiller composite indexes declined steadily in the second half of 2010, but both indexes remain above their April 2009 low–the CS10 3.9% and the CS20 2.3% above their low. As we have discussed in previous months, the situation is mixed across the metro areas. Nine markets remain above their 2009 lows, while eleven have slipped to their lowest level since house prices peaked in 2006 and 2007. 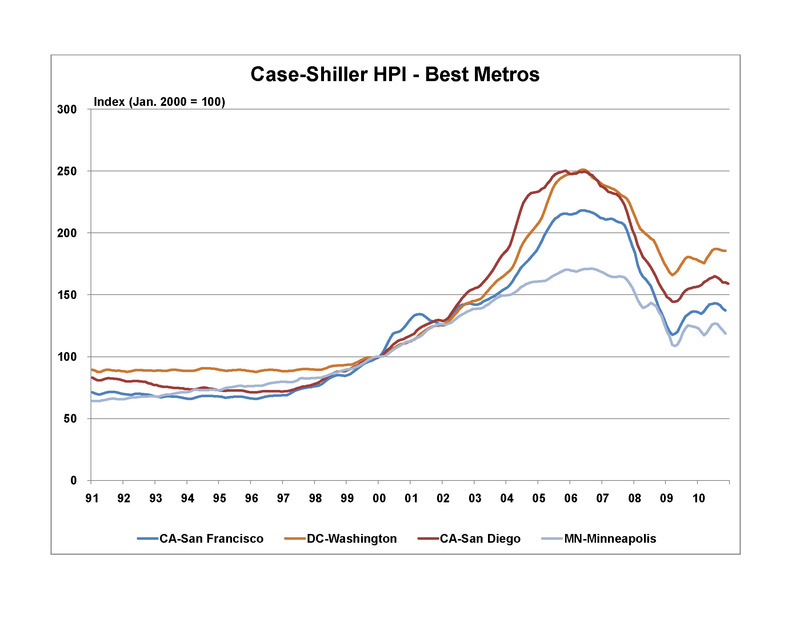 The strongest markets include San Francisco (15.4% above their 2009 low), Washington DC (12.2%), San Diego (10.1%), Minneapolis (7.8%) and Los Angeles (7.4%), with Boston (4.6%), Denver (3.2%), Cleveland (3.0%) and Dallas (2.1%) also above their 2009 low. Home sales were weak in the second half of 2010, which had a negative impact on house prices. However, home sales turned the corner in December, with both new home sales and existing home sales experiencing a strong bounce, up 18% and 12% respectively. The rate of growth will ease, but driven by a steady decline in the rate of foreclosures started and the improving employment situation, we expect home sales to continue to rise through 2011. The increasing home sales will bolster house prices and stem any further declines. The Case-Shiller house price indexes are three month moving averages, with the December data reflecting sales in October and November. Due to the lagging nature of the data, the numbers may not fully reflect the latest improvement in sales in December. There are some signs however, that the improving home sales are beginning to be reflected in house prices, with seven of the twenty metros either increasing or remaining flat on a seasonally adjusted basis in December. As home sales strengthen over the next few months, many of the other metros are likely to turn the corner, driving a steady rise in the composite indexes. However, weak markets, such as Las Vegas, Phoenix, Tampa, Miami, Detroit and Cleveland may continue to struggle over the next six months and further declines in these markets are possible.